My name is Brian H. Appleton, I was born in Tokyo, Japan in 1950. I grew up in Greece and. I lived in Italy from 1955 to 1966 in Tirrenia and Livorno and boarding school in Rome where I made my first and longest friendship with an Iranian. He was a boy one year older than me named Touss. We are still friends to this day. Eventually I graduated from George Washington University in Washington DC with a BA in Anthropology but not before going back to Italy Siena from 1970 to 1972 during which time I was a fine artist and did two one man shows and several collectives. 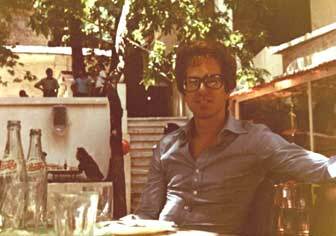 I then spent 5 years from 1974 to 1979 working in Tehran. I have been living and working and raising a family in Northern California since 1987. In the past five years as a freelance journalist I have written interviews of Iranian independent film makers as well as a large body of articles about my experiences in Iran and my political views about Iran in several English language publications and editions including but not limited to the UK Guardian, The Iranian Times, Al Jazeera Magazine, Payvand News, The Persian Mirror, Irandokht Magazine, The Persian Heritage Magazine, CASMII. (Campaign Against Sanctions and Military Invasion of Iran), Hackwriters.com and LifeinItaly.com. I saw the revolution of 1979 from start to finish and stayed on four months after it was over. I did not really want to leave Iran and my friends there but finally foreigners were no longer being allowed to work there and so I had to depart. It was a major change in my life to repatriate to the USA and several decades of hard work and hardship followed which helps me appreciate what the Iranian diaspora has gone through. Trying to rise and succeed in America, “The American Dream” not withstanding, can be a lonely and very difficult struggle without the old world network of friends and extended family and with fierce competition in every field in a culture not particularly imbued with a strong value for helping strangers and in fact often full of bigotry and prejudice against Middle Eastern immigrants. I feel that Iran is a huge part of my life, my childhood, my memories, my values, my friendships and loves and every day not lived in Iran is a loss to me...my mother and my father came to see me during the years I lived in Iran and they too shared my love for that country and culture. I feel that I became an adopted member of my extended Persian family, the Sepehr family, during my stay in Iran and from them I learned many things that no one else had ever taught me and they enriched my life in major ways. I know the values of the Iranian people despite the propaganda generated by their government and ours in the USA. Iran has been victimized and demonized several times within the past century and this current administration is just the latest round. I have made it my personal mission to try to keep a human face on Iran in order to do what I can to stop an invasion and subjugation. The predominant interest in Iran in the West is access to its oil reserves and not in the rights and freedoms of its people or the richness and preservation of its culture. The economic globalization is reducing vast and rich cultural diversity into a faceless consumer and concentrating power into the hands of fewer and fewer parties and in the process it is making the world a bland and colorless if not boring place to be and I for one fight that trend in the only way I know how with my writing. In my heart and I know in the hearts of many, that I would rather be a nomad riding a camel into the sunset of an uncharted desert than stuck in traffic for three hours in a 50 mile commute everyday in any major urban area on the planet. We have too much of everything these days, too much information, too many gadgets, too much stimulation, too many debts, too much of everything except the quality of life and meaningful life long friendships. I was the beneficiary of five years of kindness and generosity in Iran and also of a chance to self-actualize and be everything I could be. I achieved many personal goals in Iran which I have never been able to realize anywhere else and for all this I am eternally grateful and humble and I want to give something back. I write because I feel compelled to write.